Smart Spin™ was made with the understanding that there are some things in a home that we simply cannot live without. For example, food-although sometimes, we find that we have too much of it. Another thing we can always use a little more of is space. Now imagine if you had 48 containers to organize and store your food items, save leftovers, pack lunches-and save space, too. Fantastic. And even better, it is possible. Smart Spin is a storage system where everything you use to pack in their different sized containers can be stored into the spinner, which is about the size of a coffeemaker. You can simply spin the carousel and find the food container that you are looking for. The spinner is so small, that it can easily fit in a cabinet, on your countertop, or on a shelf. You get 48 pieces in all, and although the containers come in different shapes and sizes of eight, 16 and 24 ounces, all the lids are interchangeable with each container. With each piece, you will never have to worry about finding the right lid. 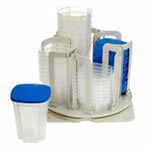 All the pieces are also dishwasher machine safe and microwave safe, too. Spinning the spinner is so easy. Even if you were blindfolded you could do spin the spinner and find your container of choice. And for larger families, there is an expansion pack available. So gert smart, and get the Smart Spin. Use the links below to find the best offer of Smart Spin™.